Bloating. We all experience it, and I am pretty positive we all hate it. If we could keep our stomachs looking lean and flat all day, the world would probably be a better place… Well maybe not, but we definitely would feel happier! Bloating can be uncomfortable, painful, and sometimes a blow to our self-confidence (even if it is completely normal). Even though most of us will experience some bloating due to the expansion of our intestines, and the healthy bacteria in our gut, there are definitely ways to decrease to what extent we bloat. Why do we bloat anyway? Inside your gut there is a surplus of microorganisms. Simply put, components of what you eat, they eat. Some nutrients from what you are ingesting do not get fully absorbed early on during digestion and make their way into the large intestine. This makes the healthy bacteria in your gut pretty happy. For you? Not so much. The natural by-product of this is gas production. This is a completely normal process, which is why we all bloat. Thankfully, it is possible to decrease to what amount that we bloat. There are some foods that these bacteria like more than others, and a smaller intake of these foods could help with the reduction of bloating. A good outline of some foods that could promote bloating can be found on a list of high sodium foods and high FODMAP foods. 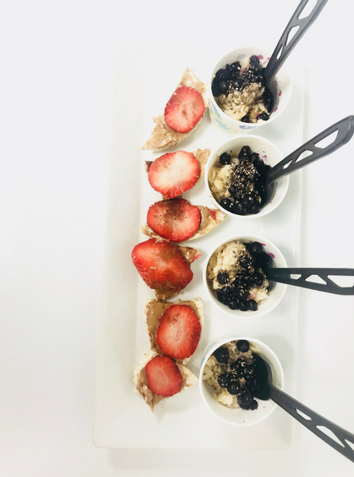 FODMAP diets are typically recommended for individuals with IBS (irritable bowel syndrome) and correlate to different categories of sugars your body doesn’t digest easily. Some of these include lactose, fructose, and sugar alcohols. Avoiding ALL the foods that fall under these categories is certainly not necessary, because there are plenty of nutrient-rich, fiber-filled foods on this list, but lowering your serving sizes per meal can help reduce bloating. Lower consumptions allow you to still get the nutrients from these foods, but also speeds up their digestion without overwhelming your gut. • Sugar alcohols such as sorbitol and xylitol. These are just to list a few, and by no means does this mean these foods should be cut out of your diet, but when talking about bloating specifically, moderation is key. Snacking throughout your day can help keep you full between meals and can lead to consuming less when you sit down to eat. These more frequent, low-volume meals can help speed things along and give your body time to digest nutrients earlier in the intestinal tract, so that less bloating occurs. 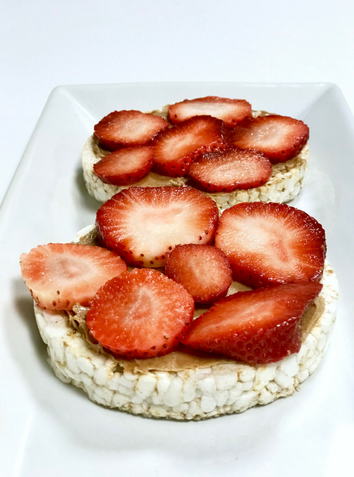 Rice cakes are the perfect base for snacking. They give that carbohydrate component while staying low calorie and gluten-free. Just keep your eye out for “Low Sodium” or “No added salt”! Almond butter adds some protein and healthy fat, which will help keep you full until your next meal. Opting for raw almond butter is best because that usually ensures no added salt. Picking up a jar of this would be a good investment when trying to dodge bloating because almonds are digestive-friendly and delicious. Gluten-free granola has become pretty easy to find these days since granola is primarily oats, nuts, and seeds. These are usually filled with healthy fats and some protein. Adding in some almond milk (or lactose-free milk) and half of a banana can help you feel more satisfied. Unsweetened almond milk is an easy way to reduce your sugar intake for this meal because granola can often be high in sugar. 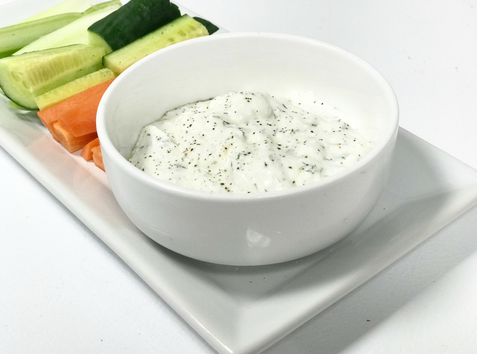 Finding lactose/dairy-free yogurt and cottage cheese can usually be found any grocery store and mixing these up with some dill (fresh or dried) with some lemon juice and pepper creates a great dip for celery, carrots, and cucumbers. This is easy to make in large quantities, then portion out when you need a snack on the go. Preparing sweet potato fries is easy and delicious. All it requires is slicing them up, drizzling some olive oil or coconut oil, and sprinkling some rosemary and pepper. Adding salt is a preference, but when trying to watch bloating, it is best to forget the salt shaker! Bake at 450 degrees for 20 minutes and you are set! Oats are super filling and provide a good amount of protein. A small serving (⅓ cup) is a perfect snack that is also gluten-free and quick to prepare. Fresh or frozen blueberries, raspberries, strawberries, or banana can be added on top, but serving size is everything. Trying to keep it simple will help your body with digestion, which will then reduce your chances of bloating. Sweetening with pure maple syrup is better for bloating than honey and agave, even though all are great natural sweeteners. Quick tip: Bloating happens and sometimes we can’t avoid it. Enjoying a cup of hot water with lemon slices and fresh ginger can sometimes help reduce bloating and the discomfort associated with it! Come visit Nourish on Sundays and see Layla for any follow up questions! Content of the blog is opinion and not to be considered scientific fact. All readers should consult a medical professional for questions concerning individual medical and dietary needs.